The all New Gear Cube with 6 color high quality Matt German Vinyl stickers. The Gear-cube is a brand new concept in cube design and has the following inventive steps. Using a full gear mechanism that requires twelve 90° turns to complete one rotation but having said this it is still slightly easier then the Rubik’s cube, Designed by M. Oskar van Deventer and inspired by a gearing idea by Bram Cohen, it will be Meffert’s Puzzle Of the Year for 2010. Placing the gears externally, so that their orientation can be seen, Adding gear teeth to the corner and edge pieces and using a new speed cube inner core. 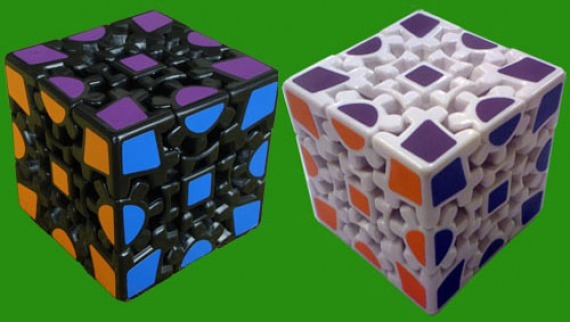 These steps result in a twisty puzzle that on the one hand has some of the features and attractiveness of the original Rubik’s Cube. Whereas on the other hand it creates a completely new and unexpected solving experience. A first solving reward is getting the puzzle to its cubic state. This is relatively easy. A second solving reward is getting the puzzle to a state where each face has only two colors (of opposite faces).This is a bit harder, but achievable for many people. Hardest is solving the puzzle as a whole, which is still easier than the original Rubik’s Cube.